Here at ChiIL Live Shows we're looking forward to another season of edgy, insightful productions from ATC. 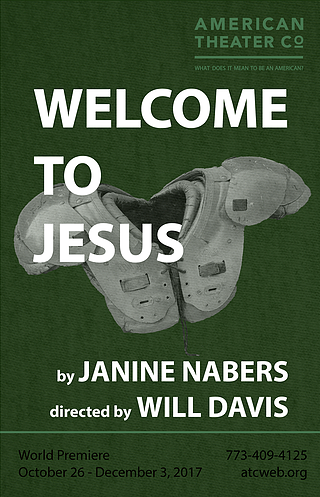 We'll be out to review their season opener, Welcome to Jesus, on October 30th, so check back soon for our full review. American Theater Company (ATC) announces complete casting for Season 33 productions: Janine Nabers’ world premiere of Welcome to Jesus, directed by Artistic Director Will Davis, October 26–December 3, 2017; Basil Kreimendahl’s Chicago premiere of We’re Gonna Be Okay, January 25–March 4, 2018, directed by Davis; and Carlos Murillo’s world premiere of Diagram of a Paper Airplane, May 3–June 10, 2018, directed by Bonnie Metzgar. www.atcweb.org or call the ATC Box Office at 773-409-4125. 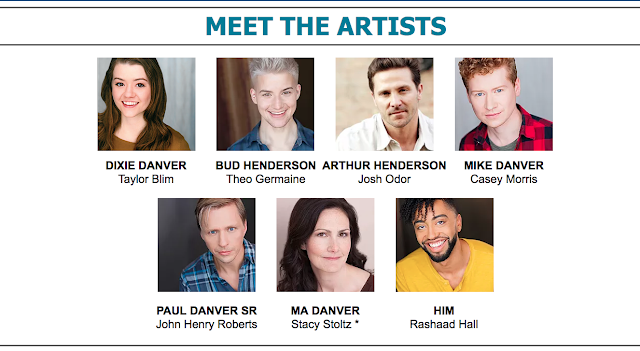 Cast: Taylor Blim (Dixie Danver), Theo Germaine (Bud Henderson), Rashaad Hall (Him), Casey Morris (Officer Mike Danver), Josh Odor (Coach Arthur Henderson), John Henry Roberts (Sheriff Paul Danver Sr.) and Stacy Stoltz (Ma Danver). In fictional Hallelujah, TX, football reigns, and the quarterback is king. Janine Nabers’ darkly funny and powerful new play unearths the tyranny of small town life and the power of prejudice to define our fate. Staged in a field of wood chips, about a town in search of some good news, Welcome to Jesus fuses fable and horror in a twenty-first century take on the Southern Gothic tradition. Cast: Adithi Chandrashekar (Leena), BrittneyLove Smith (Mag), Saraí Rodriguez (Deanna), Avi Roque (Jake), Kelli Simpkins (Efran) and Penelope Walker (Sul). In the midst of the Cuban Missile Crisis, President Kennedy addressed the nation, “My fellow citizens: let no one doubt that this is a difficult and dangerous effort on which we have set out...But the greatest danger of all would be to do nothing.” Well, Efran and Leena and Mag and Sul are thinking about doing something. Something big. 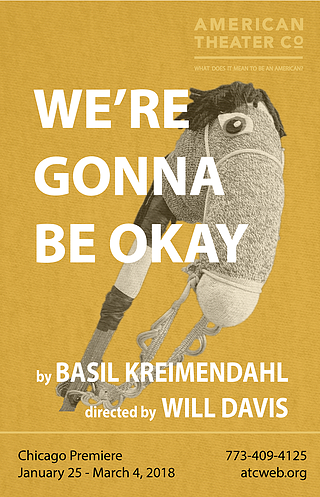 Straight from Actors Theatre of Louisville's Humana Festival of New American Plays, Basil Kreimendahl’s We’re Gonna Be Okay confronts the fears of the American middle class as two families wrestle with macrame, female empowerment and a shared property line. Cast: Nicholas Bailey (Mario), David Cerda (Alvaro), Lawrence Grimm (Herman), Rebecca Spence (Valerie) and Allyce Torres (Lila). Javier C. is dead, and in his wake are fragments and scraps of his magnum opus mailed mysteriously from New Mexico to his group of ex-friends in New York. 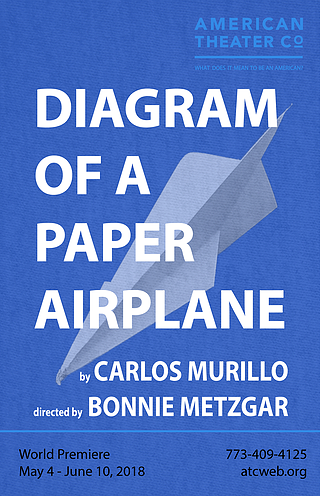 Called "an absolutely extraordinary achievement from a writer at the height of his powers” by American Theatre Magazine, Carlos Murillo's Diagram of a Paper Airplane is the first in a trilogy of plays that examine the capacity of friendships to withstand the unimaginable. Director Bonnie Metzgar brings life to a night of mourning and celebration that will leave them wondering if Diagram of a Paper Airplane ever existed at all. ATC remains committed to its partnership with Chicago Inclusion Project, whose work creates inclusive theater experiences that bring together Chicago artists and audiences normally separated by physical ability, gender identity and/or ethnic background. The two companies partner on casting, giving diverse theater artists access to roles they might traditionally have been excluded from. Together with the Chicago Inclusion Project, ATC will continue its commitment to presenting works that boldly reflect the diversity of stories and experiences in America today. Past world premiere productions at ATC include Stephen Karam’s Pulitzer Prize- and Tony Award-winning play The Humans and Ayad Akhtar's Pulitzer Prize-winning Disgraced, both of which enjoyed acclaimed Broadway runs. In Season 32 ATC produced the regional premiere of Jaclyn Backhaus’ Men On Boats, immediately following its Off Broadway run at Playwrights Horizons; reimagined classic, Pulitzer Prize winner Picnic by William Inge; and presented Dan Aibel’s world premiere of T., an exploration of the competitive ice skating saga between Nancy Kerrigan and Tonya Harding. The Pauls Foundation and Robert & Isabelle Bass Foundation.